There, I’ve said it! Bang go all my invitations to speak at women’s groups across the country! And on the day that a woman, Julia Hobsbawm, is appointed the first ever Professor of Networking. In my defence perhaps I should explain further. First, I hate it that women only events still seem like a good idea, are still necessary. Women’s networking groups are springing up all over the place; I even attend a few from time to time. I go because I like the camaraderie, supportive atmosphere, and because I run courses for women so obviously I need to let women know that I run courses for, er..women! A group of women in one place is a good place for me to raise my visibility (although actually as my clients come from all over the world, this is less significant than it used to be). Presumably all the other women go for similar reasons; they are business women so why would they willingly limit their market and networking by going somewhere without half (maybe more) of the working population? The answer to that conundrum reveals itself when I make a rare appearance at other networking events, usually at the behest of someone who thinks it would be great for me. I am not shy or retiring at all and I have a healthy ego and don’t lack in self confidence. But I tend not to like most of these groups because they feel so, well, full of men in suits. Now I like men in suits as a rule, but there is something that seems to happen collectively at these events that is a real turn off for me. I know opinions very widely on this (and please share yours in comments below) but usually there is a strong whiff of testosterone and competitiveness at play which just doesn’t suit me. Yes, they’ll be a few women present but always in the miniority. But men shouldn’t have to change their preferred style, and women shouldn’t have to behave like the men to get the best out of the group. Can we co exist? (generalising wildly, I know – there are some men who would much prefer to be at an all women event and vice versa). Yet not networking effectively has been identified as one reason why women don’t progress in organisations (L.S.E literature review). If men still hold more powerful positions than women, and we know they do, is a woman’s networking group the best place for an ambitious woman to go? Are we losing out on a powerful source of promotion (self or job)? Does having women only networking groups weaken us in the eyes of our male counterparts: are we placing ourself at an automatic disadvantage, like a minority group that needs something different from the majority of the population? We’re not a minority group, we’re half the population. How would we feel if men only networks were a growth industry like women only networking groups? If women only networking groups didn’t exist would we converge en masse on the male dominated variety and make them less testosterone fuelled and more gender neutral? Would they become places which served both men and women well? Do we still need women only groups because women’s issues are not addressed in mainstream groups? What do you look for in a networking group? Please do comment below; I’d love to know what you think! Click here to find my networking exercise. What a thought provoking blog – it caught my eye because I also have a ‘dislike’ of women only networking yet have found myself a member of a really good group and when asked why, I couldn’t quite explain it. And you have summed it up very well here. I dislike immensely the idea that women are somehow a minority group. Actually I dislike the idea that anyone should be part of a ‘special group’ as if we want to be treated the same we should stop separating ourselves. But at the same time, we are different. I know men and women learn differently first hand as I treat my male clients very differently from my female clients. Great food for thought and I’m very interested in hearing more from you! Thanks Sam. When I started to write the blog I wasn’t sure how it was going to finish! It’s a thorny topic. I also don’t think women’s groups/inititiatives in organisations are a good thing either. For several reasons but not least because if we want things to change we need the men on board too and for equality not just to be seen as an issue as an issue for women. I still think it needs addressing but call it a gender equality initiative and make it a company objective. Don’t ban men from attending; there are lots of men who feel as strongly as we do. I say that as someone who ran a group for women who wanted to get into management at my old organisation but that was about 17 years ago! And there were no women managers at all…. Live and learn! My absolute favourite topic: the difference between men and women, which are indeed significant. However, does that mean we “need” women-only networks? I don’t think so. I think we are perfectly capable of joining networks where both men and women are allowed, and I have to say that I don’t join women-only networks out of principle, even though I enjoy attending them once in a while. There are lots of women out networking nowadays, and even though at some events there are still more men than women, that would soon change if there weren’t any women-only events as safety blankets! If a woman runs an event, she can inject enough female power into it to make it female-friendly, which can only be a good thing. I believe that women should be encouraged to start their own businesses, as they already have so many of the skills needed to do so, and I understand that it might be daunting in the beginning. Having said that, lots of women who start their own business come from a corporate background, which is still hugely male dominated. So I’m sure they’re more than capable of dealing with a few men in suits, so I still come back to there being no need for women-only networking. Networks run BY women absolutely, so that men can see that running a business differently can also be hugely successful, but if all of the women-only networks starting allowing men to attend tomorrow, it wouldn’t be soon enough. Let’s not create more division, but focus on how we can best work together, making the most of each other’s strengths and helping each other with the weaknesses: only then can we be really successful! Cheers Inge!See my response to Philppa below; I think we’re on the same page. literally and figuratively in this case! You stated that your courses are gender specific, so are the way women and men network. We network differently. I think women only networking events (which I host) are great to teach women how to effectively and correctly network. I still attend networking events with both men and women. I think the diversity of attending several types is necessary. But women networking only events are essential to help build the confidence of a woman entrepreneur who may not be ready to attend a networking event with both men and women. But just attending women only networking events will limit you. Thanks!Interesting comments. It’s always nice to know who we’re talking with so please do leave a name too! Having just stepped down from the Association of Women Travel Executives (AWTE) as Chair, I thought you might be interested to hear about how we addressed this issue just prior to finishing my tenure. We have revised our membership strategy to include a level that involves men! This was a quantum leap for a fiercely women-only organisation that has been going for nearly 60 years. However, we felt we needed to modernise to ensure we addressed the BUSINESS NEEDS of today. As with many industries, whilst female staffing levels in travel are high generally, they are disproportionately low at board level (although great that Thomas Cook’s new CEO is a woman). Our new strategy helps us engage with the most senior men in our industry and gives them the opportunity to demonstrate their commitment to the careers of women in their organisations. So far, the men have greeted this evolution with interest and are keen to engage with us, find out more and feel included – as soon as we announced it one of the most senior men in the industry stepped up to sponsor and speak at an event we were running at a major conference in Barbados! It’s too early to judge the long-term effect, but watch this space! Karen, thanks for this contribution – please keep us posted! As you know, I set up and run WomenMeanBiz, a networking organisation for professional women in business and women entrepreneurs. I love your full article by the way … and I met Julia Hogsbawm in London last week when she did her inaugural lecture as the worlds first Professor for Networking! She is most inspirational. By the way, we have enjoyed having you come to WomenMeanBiz as a speaker and certainly hope you will come back again! I think that Sue has hit the nail on the head. It’s about offering choice and there are many fantastic networking groups you can choose to go to, each offering something different. I would always recommend to everyone to join more than one network group anyway and agree you should not limit your market reach by staying in an all female environment …. unless of course your market is all female! You have be realistic that 90% of business owners are men …. so let’s remember that we have a long way to go! Most mixed gender groups host their meetings early morning or evenings and this doesn’t work for a lot of women who are balancing family commitments with work. Not only that, the environment is completely different with an all female group … much more supportive and some of my members join because they work in a male dominated environment and just want to mix and meet other women in business. It’s all about getting the right balance. As a women only network group, we are growing fast and getting more and more enquiries all the time from women wanting to join up. So clearly there is a real demand for what we offer. Another point is women do not always network for the same reasons that men do. It is not all about getting new business and some women network to build confidence, get new ideas, find support and mentors, and to meet other like minded women in business for friendship and to build long term relationships without an agenda. This might seem foolhardy but if you take away the pressure to get new business, and look to help others first and foremost, you will be amazed how business just comes to you without trying too hard. I could go on and on …. but need to go pack now as off on holiday. Love your article Jane …. great Blog! Philippa, you are so right about men and women using networking for different things, and you make some really good points here. But the one thing that keeps nagging me at is, what would we think about networking groups that were men only? If they were cropping up all over the place I’m sure I’d be banging on about them and not in a good way. Relative power and status plays a part; I guess in the main men don’t feel a need for exclusive networking groups because they started them and they run to suit them, generally speaking, so women felt a need to run their own. Which makes me want to try and define what is it about women’s groups that makes them attractive to women and could we set up a group with those values which could still remain true to itself by being mixed? Hope you’re having a grand and well deserved holiday! It always amazes me just how much gender stereotyping is glossed over in order to justify women-only events. I completely understand the reasoning for organising events that suit many women – I just don’t see the need to go the step further and bar men from attending. The classic is claiming that they are necessary as women are often balancing work with family commitments. Whilst that is true, it’s actually parents – both men and women – who are in that situation. Yes, the fathers juggling work and family may be in the minority, but they do exist. Men only networking events of this type rightly wouldn’t be seen as acceptable. Equality won’t come from creating further division. Jane – this is so topical for me at the moment. I’m a personal development coach with my own business and a keen interest in networking and I’ve found no difficulty networking at groups from WIRE (women only) to 4N and BNI (mixed). However, I am currently revisiting my business planning and am changing my focus slightly to looking at mentoring women new business start ups and setting up both a women networking group and a new business start up group in my local area. I’ve decided on this area of focus because I believe that although I have no problem with mixed networking groups, some women do. And lets face it, to get the best out of your networking, you have to put your all into it – you cant do that is you feel uncomfortable. I’m also involved in starting a brand new WI group in my area. But I like you feel a little awkward about creating something that is exclusive. I know I’d be a little angry if I couldn’t attend a male only network. But I saw some reported stats showing that women are far less likely to enter self employment than men albeit they were a little out of date. I have to say I was an avid networker for a few years .. Women only groups and mixed groups. The problem that I found (from a business point of view) is that companies who network tend to be too small .. and the same people attend most events. I certainly liked the people I met (and still have great relationships with some of them) but from MY business point of view in the end it just wasn’t making business sense for me. I can be more productive doing an hour of sales calls than attending networking meetings. As for Women only events .. some of them I attended tended to be more of a lunch jolly .. and a bit clique! .. sorry to be negative! Actually we met first through twitter and then at a networking event in Scotland so I’m glad I went on that occasion. I have recently rejoined a group locally but purely for the enjoyment factor-I don’t expect to get any business out of it but it will keep me alive to the issues businesswomen are facing so indirectly will help with my content on the site etc. Thanks for dropping by. Hi Jane – thanks for your ever topical debate and it is lovely to see some lively discussion on networking. I would like to start from the point of ‘what is networking and what it means to me’. My interpretation is that it is meeting and finding out about the work and opinions of anyone from outside of my immediate social circle or ‘team’. 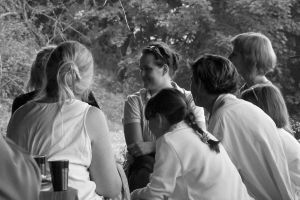 For me a friendly and often informal chat can often yield information on what is going on elsewhere in an organisation, priorities and what differing technical specialisms do on a daily basis. I have found it to oil- the-wheels and pin point opportunities to seek out and has made a positive impact on my career, particularly when also utilising my signature strengths. Networking can tick many of the boxes from the LSE coping strategies that you have set out in your post. Finding out about anything from corporate culture, strategic direction to ideas on making childcare work in a demanding job are all things that I have found on my networking adventures. For me, it should be informative but also fun. The next question has to be where – well anywhere is my take on this one if you can find someone of relevance to speak with. I can happily say that I have found conferences, consultation exercises and meetings to be fruitful, but then so can convening around the kettle or in the pub. I don’t think that there can be one-size fits all, but for me networking is what you make it and if you are inquisitive and like finding out about people and organisations then it shouldn’t pose too much of a problem. The whole gender issue could well be clouding judgement. In my opinion the key questions to ask are whether the networking fulfils any sort of need which could be anything from social support to intelligence gathering about organisational or sector issues. My overall recommendation would be… ladies go and do it but be prepared to move a little outside of your comfort zone. Above all ..enjoy it! Thanks Alison, great to hear your views. Coincidentally i am mid way through my second post on this topic which will go out tomorrow I think. Look out for it. I’m getting even more radical! I’ve attended both types of group in the construction industry. However, the women’s groups that I attend aren’t “women only” and are happy for men to attend too. I’ve taken a male colleague to a couple of the events and they find them really enjoyable. It certainly gives them a taste of how I feel attending events that are predominantly male. Like Jayne J above, I have found networking in my area less than satisfactory. Outright bitchiness occurred on some occasions and too much self-promotion was noted in some settings. At the end of the day, I felt like I’d done a lot of running round after other people, but could find precious few who would step forward on the one occasion I asked for a helping hand. Those who did were men – a sad reflection on our gender, I felt. Has it put me off networking? Yes, a little. I still see value in meeting and learning from others regardless of gender, but I know I’m more circumspect about where I go and with whom I speak now than before. Sitting as I do on the other side of the fence I find the ‘Women’s Network’ at my place of work divise, hypocritical and unfair. It seems that with all these issues one gender always assumes that life is much easier for the other, when in fact they each have their own strengths and challenges. Very little of what is covered by our ‘Women’s Network’ is actually gender-specific; rather it offers support, advice and opportunities that would be valuable to all individuals regardless of gender (or any other criteria). I agree wholeheartedly that having an equal mix of genders in a network (or indeed place of work) would be much healthier and constructuve.